A bill introduced Thursday by Justice Minister Kathleen Ganley will amend the Alberta Human Rights Act to make discrimination against transgender people against the law. The Alberta government has unveiled a bill to prohibit discrimination against transgender people. Bill 7 would amend the Alberta Human Rights Act to make it illegal to discriminate on the basis of gender identity and gender expression. The bill was Introduced Thursday by Justice Minister Kathleen Ganley. 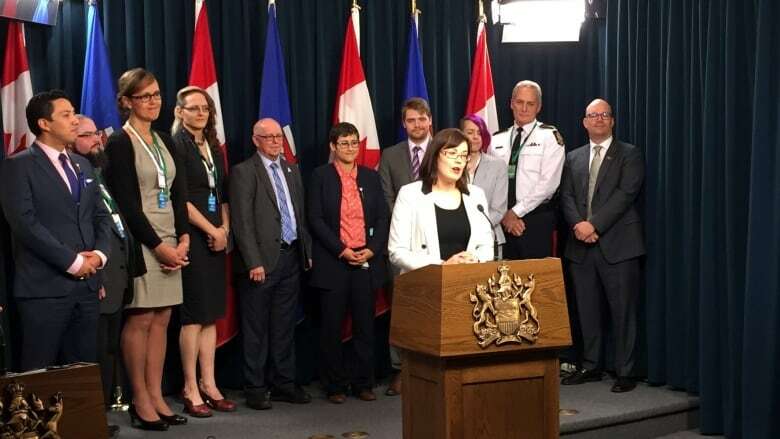 "These proposed changes will ensure trans and gender variant Albertans are treated with the dignity and respect that they deserve," said Ganley. "No Albertan should be denied basic services for being true to themselves." Mickey Wilson, executive director of the Pride Centre of Edmonton, said it was a great day for human rights in Alberta. Wilson said he went to Ottawa 10 years ago to try and push for adding gender identity and expression to the Canadian Human Rights Act. It still hasn't happened. "In all of my dreams, I never, ever imagined that the Alberta Human Rights Act would be amended first," he said. Calgary transgender rights activist Aria Ehren said she and other transgender people are feeling much more optimistic because of the proposed legislation. "There's an overwhelming feeling at times that our existence is an inconvenient fact that the world would rather not face," Ehren said. "And we often see this in the treatment that we receive, where we have been discriminated against, mistreated, shut out, denied, ostracized, fired, threatened." Ehren said having gender identity in the human rights act will help save lives and make it clear that trans people belong in Alberta. "Our laws are an expression of the values our society holds dear," Ehren said. "To be reflected in the law is to be reflected in Albertan values." Edmonton transgender activist Marni Panas was holding back tears as she described what the bill means to her. "Today, I feel a little bit safer and a whole lot more welcome in my province," she said. "Kind of speechless about that." "It's big. So many people have struggled, lost their jobs, lost their lives, just to be treated equally, just to be treated as people. And today, we are people too and the government has said so." Ganley said making these changes to the Alberta Human Rights Act was the first promise she made in her campaign to become the MLA for Calgary-Buffalo last spring. "At that time, I had hoped that at best I might advocate from opposition," she said. "It's really incredibly exciting for me to see the democratic process take us to this place." MLAs from all parties rose to applaud after the bill was introduced in the legislature. Wildrose Party Leader Brian Jean expressed support for the bill. "The aim of this legislation, to ensure that everyone has clarity over what rights are protected under the Alberta Human Rights Act, should be applauded," Jean said in a news release. "I am confident it will be passed with support from all parties." If passed, Alberta would join Ontario, Nova Scotia, Prince Edward Island and Newfoundland and Labrador in explicitly listing gender identity and gender expression as prohibited grounds of discrimination in human rights law. Saskatchewan and the Northwest Territories have gender identity as prohibited grounds of discrimination in their human rights acts.